An image of barbed wire from a Chanel Ad campaign sparked initial inspiration for this collection, from here drove researching old Prison interior. In this collection all inspiration is taken from imagery collected from primary sources, from Jedburgh Jail and Berwick Jail. These are both museums open to public with original Prison features. Concentrating on the details of the Prison drove knit stitch and surface pattern for the knitwear in this collection. Striping is a key element to the collection taken from the initial black and white Prisoner uniforms, but with a delicate edge to make the garments less offensive and less obvious to the viewer where the inspiration was taken. 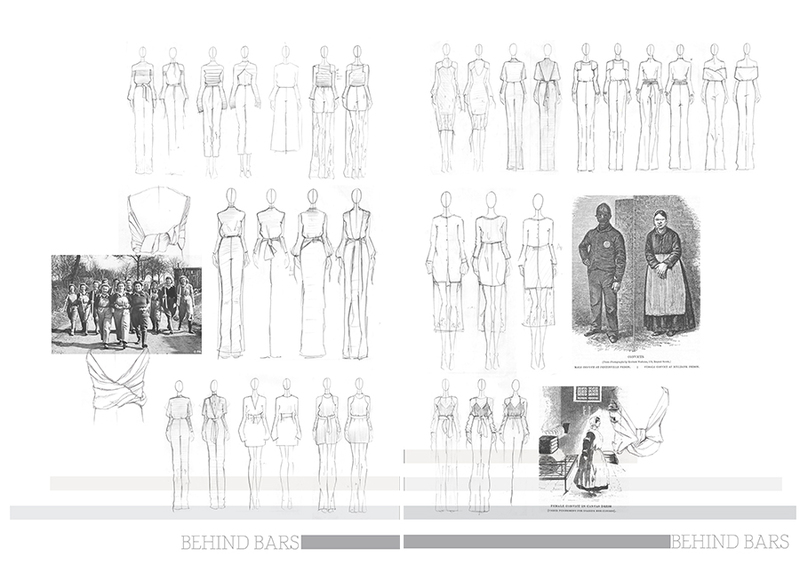 Developing the silhouette of Prison wear for shape and silhouette for the collection and looking at the strait jacket to use the details for construction, wrapping and tying of the fabrics to create constraint also experimenting with the belted aspect of the garment. Incorporating this into the garments for fastenings. Taking the ideas from something dark and serious, and making it feminine is what this collection is based around. Using an “unfashionable” dress form and making it fashionable is also something this collection entails.